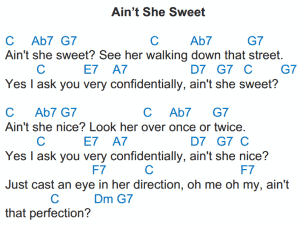 Here’s a couple of reasons why you should learn how to play “Ain’t She Sweet” on the ukulele. First of all, “Ain’t She Sweet” is a classic song that’s popular since the 1920s. 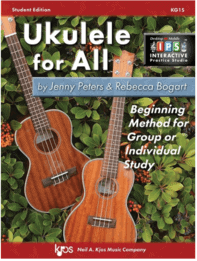 Learning it adds a historic song on your list of ukulele songs. In addition, many famous artists have performed it including the Fab Four themselves. 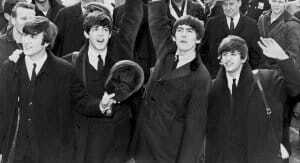 The Beatles have performed it many times as a group including a ukulele rendition in 1995. To follow the lesson easily, download a lead sheet of the song here. Jenny gives some lessons on how to play “Ain’t She Sweet” on the ukulele in the above video. Rather than play a standard ukulele, she uses a banjolele that sounds real cool and goes really well with the song. A banjolele looks like a banjo but is tuned like a ukulele. 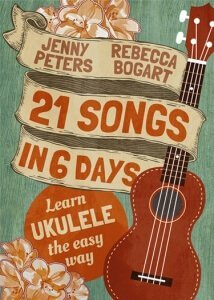 While the song may not be that easy to play on the ukulele, it has fairly easy chords except for Ab7 and F7. The other chords include C, G7, E7, A7, D7 and Dm. On the video, Jenny explains tips on how to remember the chords and how to shift easily from one chord to the other. Another thing to master when learning a song is the strumming pattern. Jenny followed a strumming pattern with a “down, down-up-down, down-up” flow. In addition, she included a chunking technique in some parts of the song. This technique introduces a percussive effect by using the area on the side of the thumb which Jenny illustrates on the video. New! Learn Ukulele in group or solo..
“Ain’t She Sweet” is a timeless song that first became famous during the Roaring Twenties, a period around the 1920s characterized by progress and vitality in America and in Europe not only in the economy but also in the arts and culture. The song was created by frequent collaborators Jack Yellen and Milton Ager. While Jack Yellen wrote the song’s simple yet trendy lyrics, Milton Ager composed its upbeat and lively music. Since the song’s release in 1927, several artists have recorded it including Lou Gold, Gene Austin, Annette Hanshaw, Eddie Peabody, Frank Sinatra, Gene Vincent and The Beatles. The Beatles, as a group, recorded two renditions of the song. Although the group has been performing the song in live shows since 1957, the first official recording they did was in June 1961. This recording was subsequently released as a single three years later. It was also included in the group’s Anthology 1 album which covered the band’s 1958 to 1964 era. The second recording of “Ain’t She Sweet” by the Beatles was in 1969. Although it’s basically the same song, Pete Best was on drums on the 1961 recording while Ringo Starr covered drums on the latter rendition. This 1969 recording was included in the final Anthology album, Anthology 3, which encompassed the final period of the Fab Four starting from 1968. Hence, the song appears in two out of three Anthology albums, the only song to do so. John Lennon also had a solo recording of this song which was included in CD 3 of John Lennon’s four-disc Anthology album. Finally, here’s an interesting ukulele trivia – Paul McMcartney, George Harrison and Ringo Starr played “Ain’t It Sweet” backed up by a ukulele in 1995.
great video tutorial.. thank you!